Viewing gallery of paintings some of which are for sale. 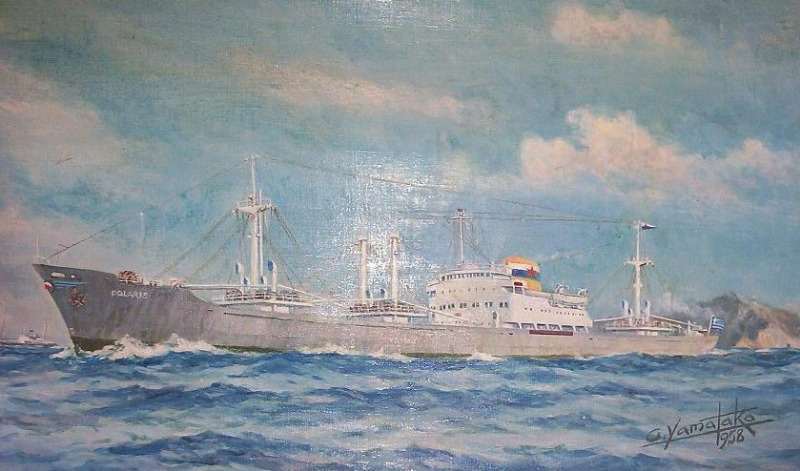 Greek flagged cargo ship "Polaris", oil on canvas, signed G. Yamataka 1958. Dimensions : Frame : 610mm x 410mm. Image : 510mm x 315mm. Goro Yamataka (1886-1981) was a shipbuilding engineer commissioned by Mitsubishi to paint ships built at the Yokohama Shipyard. He produced many high-quality documentary paintings of ships, the above being a typical example. Mount Kilimanjaro in Chagga; the two peaks Kibo and Kimawanzi. Gouache on card. Unsigned. Dimensions : Frame : 410mm x 345mm. Image : 248mm x 173mm. London Bridge, St. Paul's Cathedral, River Thames, watercolour, signed Michael Crawley, c1967. Dimensions : Frame : 420mm x 518mm x 20mm. Image : 250mm x 345mm. 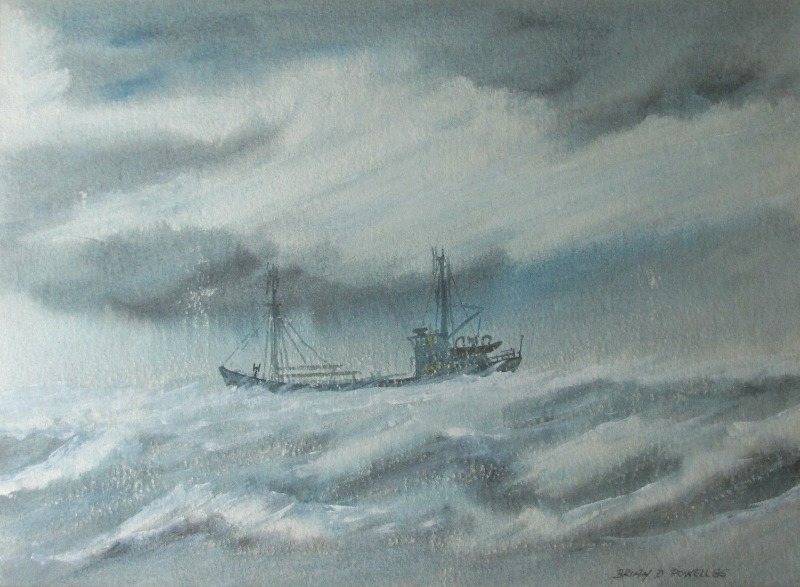 Coaster in heavy seas off Cumbria, watercolour and gouache on paper, signed Brian D. Powell, 1985. Dimensons : Frame 515mm x 426mm x 14mm. Image : 365mm x 261mm. 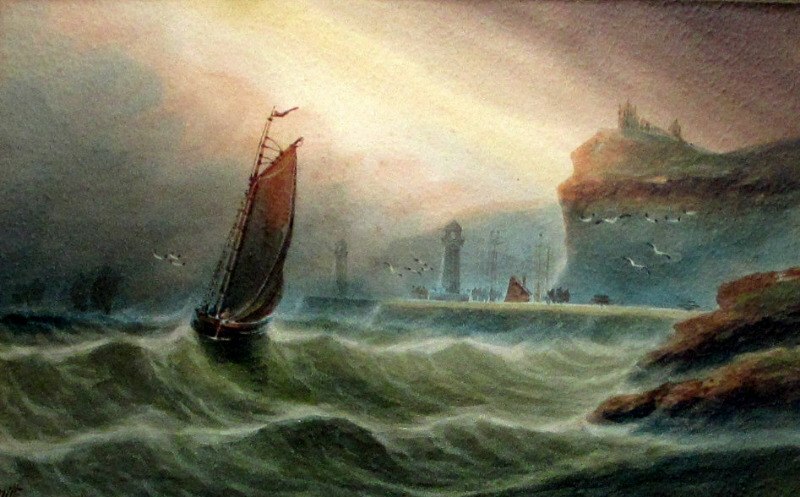 Fishermen returning to Whitby, watercolour on paper, signed A.Smith, c1920. Dimensions : Frame : 568mm x 445mm x 17mm. Image : 345mm x 220mm. Whitby Harbour, watercolour and gouache on paper, titled and signed E. Nevil, c1880. Dimensions : Frame : 435mm x 542mm x 20mm. Image : 275mm x 385mm. On the Shore at Whitby, gouache on paper, signed H Moxon Cook. Inscribed 1909 verso. Dimensions : Frame : 302mm x 350mm x 16mm. Image : 127mm x 175mm. The Harbour, Scarborough, watercolour on paper, signed Austin Smith, 1923. Dimensions : Frame : 265mm x 328mm x 18mm. Image : 125mm x 173mm. 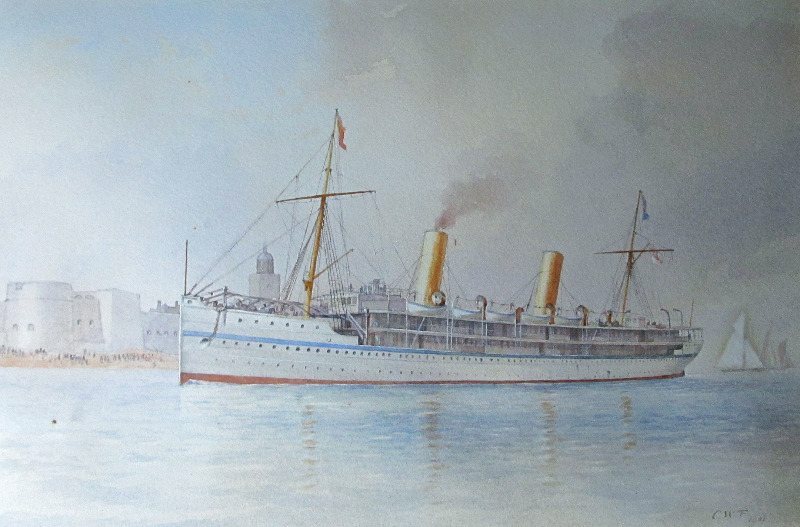 HMS Ophir entering Portsmouth Harbour on the Royal Tour 1901, watercolour on paper, signed C.W.F. (Charles W. Fothergill) 1901. Dimensions : Frame : 558mm x 446mm x 22mm. Image : 356mm x 236mm. Steamship at Anchor Discharging to Lighter, oil on board, signed monogram YD (? ), c1920. Dimensions : Frame : 366mm x 300mm x 33mm. Image : 250mm x 185mm. Grand Harbour viewed from Senglea, Malta, in the manner of D'Esposito, watercolour on paper, signed Michael Crawley, c1990. Dimensions : 702mm x 333mm x 15mm. Image : 528mm x 150mm. "Outside, Cairo", (Cairo Citadel and Mamluk Tombs), watercolour on paper, signed Michael Crawley, c1990. Frame : 495mm x 645mm x 18mm. Image : 290mm x 450mm. 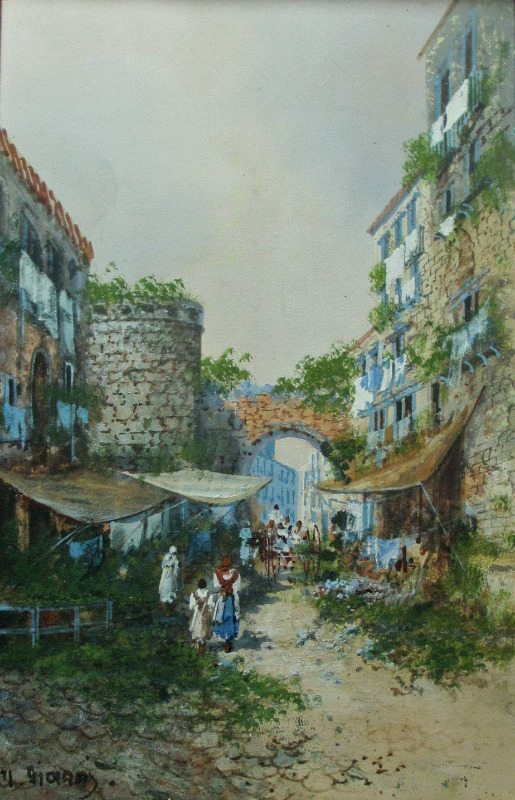 Old Street Scene in Naples, gouache on paper, signed Y. Gianni, 19th/20th Century Neapolitan School, c1900. Dimensions : Frame : 584mm x 400mm x 19mm. Image : 495mm x 315mm. Coastal View, Bay of Naples, with Mt. Vesuvius steaming in background. Gouache on paper, signed M. Gianni, c1900. Dimensions : Frame : 588mm x 398mm x 20mm. Image : 507mm x 319mm. Italian Coastal Scene, Bay of Naples, gouache on paper, signed Riva. c1900. Dimensions : Frame : 485mm x 385mm x 45mm. Image : 240mm x 158mm. 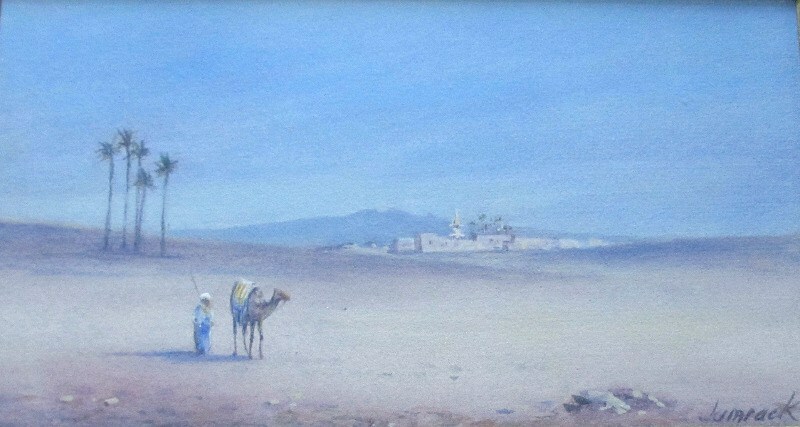 Lone Traveller with Camel, watercolour and gouache on paper, signed Jamrack (G. Jamrack, British 19th C Orientalist). c1880. Dimensions : Frame : 421mm x 318mm x 22mm. Image : 224mm x 125mm. 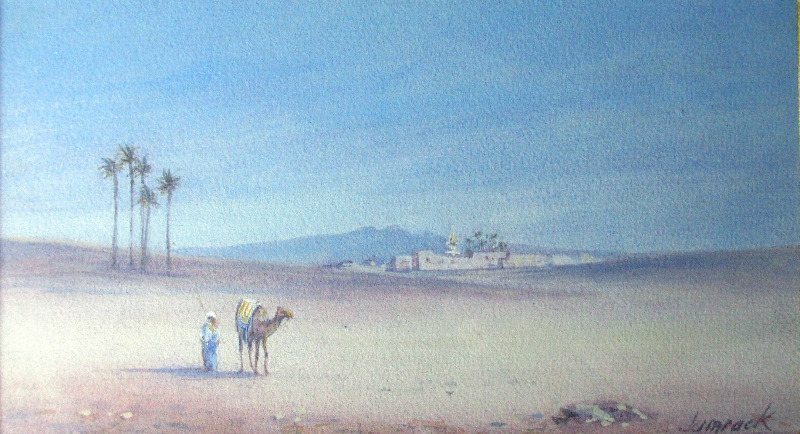 North African Oasis, "The Watering Place", watercolour on paper, signed J.W. Hepple 1915. Framed and glazed. Dimensions : Frame : 331mm x 420mm x 18mm. Image : 175mm x 250mm. Arabian Scene at Dusk with Figures and Camels resting near Ancient Ruins, gouache on paper, signed Fred. Alders. c1930. Dimensions : Frame : 440mm x 690mm x 10mm. Image : 245mm x 495mm. Arabs in Conversation in a Ruined Temple (titled verso), oil on wood panel, signed W. Muller (William James Muller 1812-1845), 1843. Dimensions : 205mm x 165mm x 6mm. North African Street Scene with Figures, watercolour and gouache on paper, signed Schmidt. c1930. Dimensions : Frame : 400mm x 543mm x 22mm. Image : 281mm x 423mm. Behind Queensferry, watercolour on paper, titled by artist lower lh corner and signed W. Muller lower rh corner. 1839. Dimensions : Frame : 360mm x 410mm x 20mm. Image : 150mm x 195mm. The Black Gate, Castle Garth, Newcastle-upon-Tyne, watercolour and graphite on paper, signed faintly initials WJM (William James Muller) lower rh corner. c1835. Dimensions : Frame : 435mm x 348mm x 15mm. Image : 240mm x 166mm. 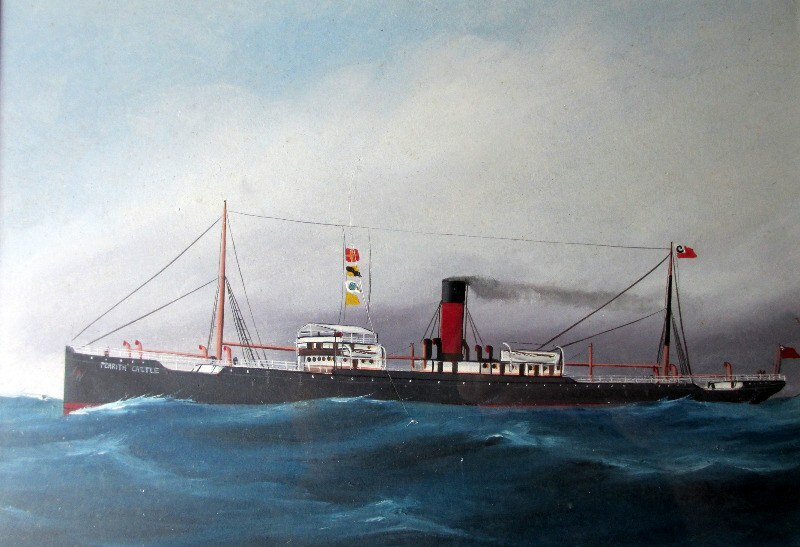 ss Penrith Castle, Chambers & Co. Ltd., Liverpool, arriving at port, gouache on paper. Unsigned - A Follower of Antonio Simone, c1910. Dimensions : Frame : 407mm x 344mm x 14mm. Image : 198mm x 138mm. 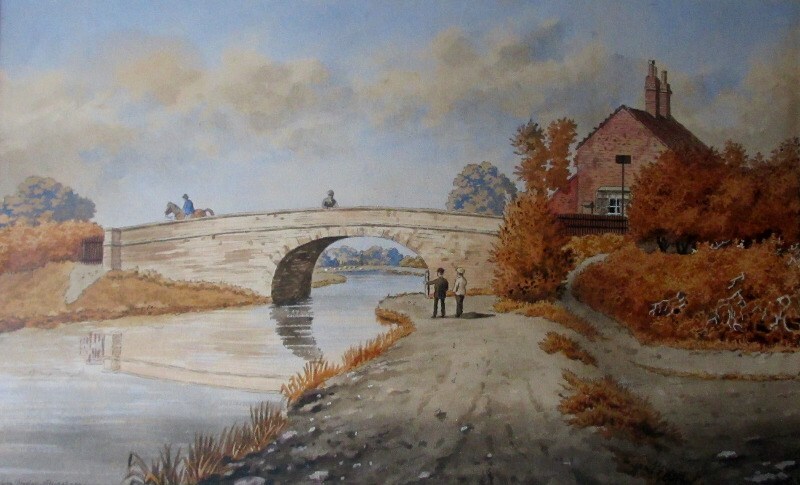 The Old Bridge, Lady Bay, Nottingham, also known as Lady Bay Bridge, watercolour, pen and ink on paper, signed Wm. Fred Austin. c1870. Dimensions : Frame : 515mm x 377mm x 21mm. Image : 375mm x 235mm. Westcliffe, Essex, watercolour on paper with gouache highlights, signed Louis Burleigh Bruhl (1862-1942), c1900. Dimensions : Frame : 225mm x 488mm x 32mm. Image : 140mm x 405mm. 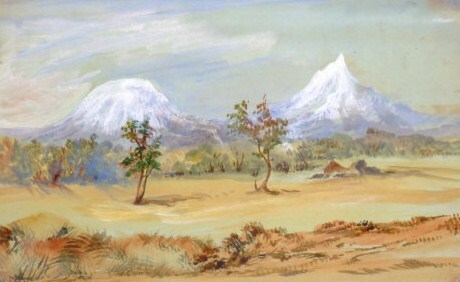 Continental Lakeside Landscape, watercolour on paper heightened with white gouache, signed Edwin Earp. c1900. Dimensions : Frame : 375mm x 615mm x 22mm. Image : 150mm x 445mm. On the River Trent near Gainsborough Lincolnshire, watercolour on paper pasted to board, signed Frank Mason (Frank Henry Algernon Mason), c1920. Dimensions : 305mm x 380mm x 15mm. Image : 150mm x 225mm. On the River Trent near Gainsborough after restoration work. Egyptian Street Scene with Water-carrier, watercolour on paper pasted to acid-board, signed Giovanni Barbaro. c1900. Dimensions : Image : 728mm x 318mm. "Fez, Morocco", watercolour on paper, signed Giovanni Barbaro, c1900. Titled verso. Dimensions : Frame : 406mm x 586mm x 20mm. Image : 200mm x 378mm. Oddicombe Bay near Torquay, South Devon, gouache on paper, signed Garman Morris. c1900. Dimensions : Frame : 319mm x 569mm x 30mm. Image : 245mm x 495mm.